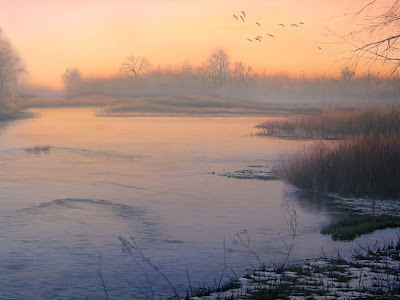 The painting South Platte Sunrise has been selected for the upcoming Birds in Art exhibition at the Leigh Yawkee Woodson Art Museum. The opening festivities are planned for September 5th & 6th in Wausau, Wisconsin. This will be my fourth time exhibiting in this prestigious show. More information will be posted as the exhibition approaches. It has been a crazy month or so trying to balance commission work, print remarques, painting for two shows and traveling to Milwaukee. The above painting is for one of the shows. Some progress was made on the detail and the painting is getting closer to being finished. The ducks themselves need some work and keeping them looking like they are in the fog while subtly showing enough detail to define the species will be tricky. 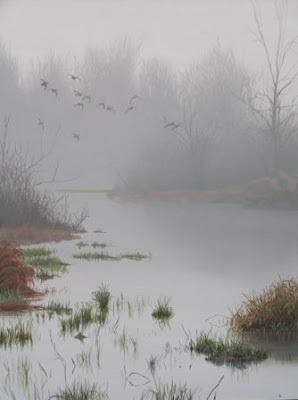 This painting is another in what is becoming a series of waterfowl paintings. Evening Sprig, South Platte Sunrise, and First Flight feel like the forefathers to this painting. I enjoy the landscape aspect with the ducks not being as prominent, but still showing that commitment to landing. After experimenting with this painting for the past couple of years, I have decided to leave it as a painting of ending rain. 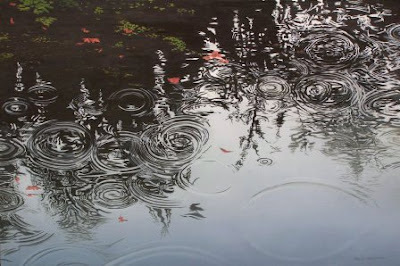 The patterns of the water are the painting and I didn't want to take away from that or change the focus in the piece. I have tightened up the water ringlets and finished it. The painting is about the peaceful play of water.